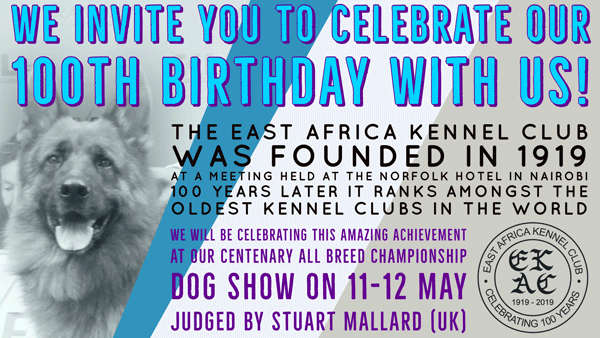 This year the East Africa Kennel Club celebrates its Centenary! The East Africa Kennel Club (EAKC), affiliated with the Kennel Club UK, was officially founded in 1919 at a meeting in the Historic Norfolk Hotel on 18 October 1919. Dogs had been exhibited somewhat informally in Kenya at least since the foundation of the Agricultural and Horticultural Society in 1902 – without a Club or Rules to govern the proceedings. After a show earlier in 1919, thirteen enthusiasts decided to form an East Africa Kennel Club ‘For the purpose of Breeding and Exhibition of Thoroughbred Dogs’. It was agreed to adopt the English Kennel Club Rules and Regulations and to apply for Affiliation, which we were granted. The first Committee Meeting was held at the Norfolk Hotel, where East Africa Kennel Club Annual General Meetings were traditionally held for the next 55 years. Since then, after a few moves, the Kennel Club office settled in to its current location rented from the Agricultural Society of Kenya, at Jamhuri Park, Nairobi, where for many years we have maintained our unique and beautiful showground, while continuing to register pedigree dogs for the region. Currently the EAKC forms is host to the Labrador Retriever Club of East Africa, the German Shepherd Dog League and the Ladies Kennel Association which each run one or more shows annually. The EAKC itself holds 2 Championship Dog Shows each year. At our 100th Show (some 30 years ago), Bobby James (Dr. R. W. James) was our judge and this year we will have the honour of having Stuart Mallard as our Centenary show judge. The EAKC is not the only one with a big birthday this year as The Labrador Retriever Club will be celebrating its 70th Anniversary one week later with Rodney Oldham as their judge. We hope you will join us in celebrating this momentous occasion.